Chinese solar power led a record 157 gigawatts (GW) of new renewable energy capacity added worldwide last year, more than double the amount of new generation capacity from fossil fuels, a U.N.-backed report showed on Thursday. Globally, a record 98 GW of solar power capacity was installed last year with China contributing more than half, or 53 GW, according to U.N. Environment, the Frankfurt School-UNEP Collaborating Centre and Bloomberg New Energy Finance. The new renewable energy generating capacity, also including wind, biofuels and geothermal energy, dwarfed the 70 GW of net new capacity from fossil fuels in 2017, it said. Fossil fuels, however, still dominate existing capacity. Solar, wind, biomass and other renewables generated 12.1 percent of world electricity in 2017, up from 5.2 percent a decade earlier, it said. Climate scientists have advised governments that renewables should be the world’s dominant source of energy by mid-century if they want to achieve the toughest goals set under the 2015 Paris climate agreement to combat global warming. 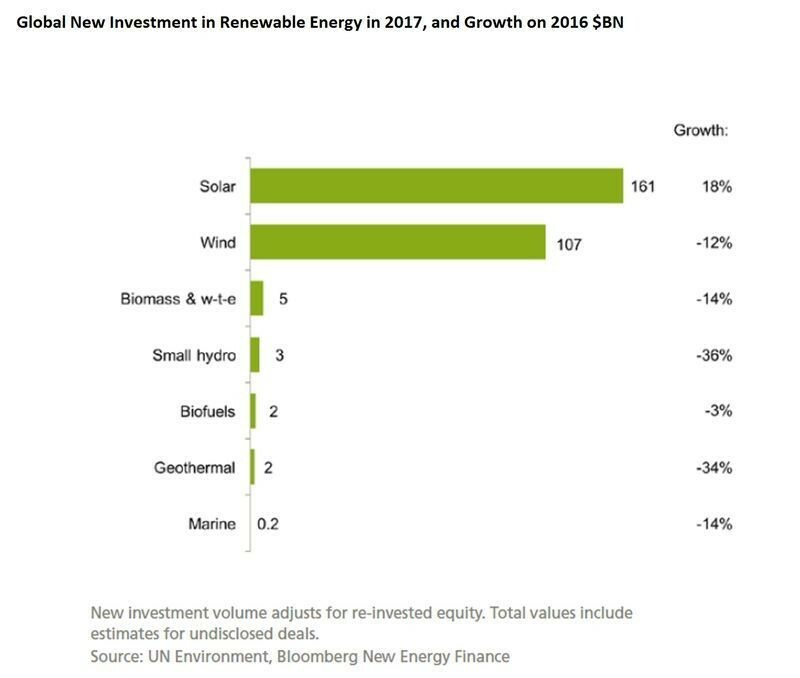 Global investment in renewable energy rose by two percent to $279.8 billion in 2017 from a year earlier. China invested the most in renewables at $126.6 billion - its largest amount ever and 45 percent of the global total. “Much lower costs ... are the driver of solar investment worldwide,” said Angus McCrone, chief editor of Bloomberg New Energy Finance and lead author of the report, told Reuters. And solar power in China benefited from government policies to help industry, reduce air pollution and slow climate change, he said. The report said the cost of generating electricity from large-scale solar photovoltaic technology fell by 15 percent last year to $86 per megawatt hour. In the United States, renewable energy investment fell by six percent in 2017 to $40.5 billion. However, it was relatively resilient to policy uncertainties under President Donald Trump, who wants to promote fossil fuels, the report said. “Trump can no more brake this than those who opposed the Industrial Revolution could stop the Industrial Revolution,” said Solheim, a former Norwegian environment minister. Still, Trump’s decision in January to slap tariffs on imported solar panels could dent U.S. solar power in the short term, McCrone said. But there was no sign the U.S. Congress would scrap tax credits for renewables that are a bigger driver of long-term investment, he said. Europe’s investment in renewables plunged by 36 percent to $40.9 billion due to factors including the end of subsidies in some countries for solar and wind and lower technology costs. “In Europe the fall in investment is strongly driven by Germany and the UK,” said Ulf Moslener, lead editor of the report at the Frankfurt School. This article is written in collaboration with Reuters.